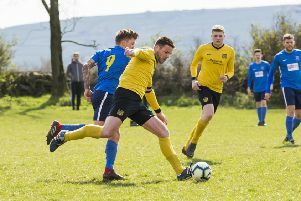 PREMIER Division leaders Midgley United dropped two more points when they were held 3-3 at home by Sowerby United in the Haslem-Sheppard Halifax AFL on Saturday. Home boss Craig Gee was left to rue missed chances by his side in the first quarter and conceded that Sowerby were worthy of a share of the spoils. Ryan Allen, Corey Henderson and Harvey Walsh scored for the visitors, who were on terms at 1-1 at half-time after cancelling out an own goal. Midgley’s best player George Bamford gave the hosts the lead again with a good finish from 10 yards but Sowerby swept 3-2 ahead and looked the better side. Bamford salvaged a draw for Midgley in the closing stages with a similar finish to the one he had produced earlier. Midgley’s lead was reduced to four points when Greetland resisted a fight back from bottom side Calder ‘76 to register a 3-2 win at Luddenden Foot. Home boss Rob Kenworthy was fearing the worst when Calder conceded three goals in 15 minutes in the first half but the in-form James Redmond set up Max Crossley to pull one back before the break. Calder’s belief was creeping back and they cut the deficit further when Steve Jones, on at half time for the injured Crossley, scrambled his side’s second after good work from Nathan Dempsey on 55 minutes. The rally appeared to be stalling until a Joe Kidder penalty save gave Calder an adrenalin shot. However, an injury to Kidder, who required eight stitches to an eyebrow after a 50-50 collision, knocked the stuffing out of their challenge. Hebden Royd Red Star climbed back to third with a 4-1 home win over Ryburn United. Tom Barclay headed the opener from a Cockroft cross but next-to-bottom Ryburn drew level with one of their few efforts on goal. Star stepped up their play and scored at regular intervals in the second half. Gormley gave them the lead with a deflected shot; a Ryburn defender flicked a header into his own net from Pat Thomas’s long throw; and Cockroft pounced when the visiting keeper attempted to play the ball short to a defender. NORTHOWRAM ran riot in the second half to reclaim second spot in Division One with an 8-1 home success over Salem. The dominated possession up the slope but were let down by a poor final ball and had to wait 34 minutes for a breakthrough. Josh Baines’ excellent pass was superbly finished by Matt Calland from a narrow angle and three minutes later neat approach play involving Baines and Ash Smee resulted in Calland heading his second. Jay Thomas halved the deficit with a contentious penalty awarded for hand ball against Allen Slingsby but the second half was a one-sided affair with Baines and Smee both scoring hat-tricks. The other game in the section produced a 5-4 win for leaders Mixenden United against lowly Elland Allstars, whose goals came from Bewn Attle, William and Thomas Chappell and Lewis Holt. A GOAL from Rowan Binns boosted Shelf United Reserves’ promotion challenge in Division Two. Binns’ effort was the only one of the game on the Lightcliffe Academy 3G as second-placed Shelf beat fourth-placed Midgley United Reserves. James Fearnley was on target for the second week running for Northowram Reserves in back to back fixtures against Greetland Reserves. Bottom club Northowram had picked up a first win of the season with a 2-1 scoreline in the home meeting and they drew 1-1 in the rematch at Goldfields. There was a derby win for Sowerby United Reserves at home to Sowerby Bridge Reserves. Lee Barker and Micah Turkaly helped United turn a 1-0 interval deficit into a 2-1 win at Ryburn Valley High School. THE two fixtures in Division Three, Flying Dutchman v Hebden Royd Red Star Reserves and Shelf FC Reserves v Crossleys Reserves, were both postponed.